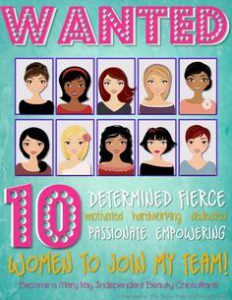 This is from Mary Kay nsd Linda Toupin. People are just numbers. And the best numbers they can be? The ones that have dollar signs in front of them! Linda bases this “Value of One” handout on a director commission of 26%, assuming that the “one” person is a personal recruit. Your customers and your unit is your immediate income. As a nsd ONE first line who debuts after you become a national = $5000 bonus + $1000 bonus each year after that until the nsd or the director turn retire. Example of 20 years = $25,000 in bonuses alone. If that same ONE offspring produces $10,000 a month production over 20 years @ 8% = $192,000 + $25,000 bonus = $217,000 per offspring. Your directors are your future and retirement income. Showing Mary Kay’s true colors again… this really isn’t about people. It’s about numbers and getting more numbers… because that’s the only way you move up in Mary Kay. ONE person who is saved from debt by reading this site. That’s the true value of one. Doesn’t MLM have to refund 90%? They don’t have to. There are reasons why a lot of them do, such as it helps them avoid allegations of being a pyramid scheme in some states. And it also makes them look nice. At least she can count. But the only thing you can count on is this: Sooner or later, the jig is going to be up. People WILL find out that they are the Ca$h cows and they will want to stop producing. So, when that happens, where will all that nice MATH be. I say, it’s better to be a Math teacher than to count on someone else for your paycheck or commission.